AD Sound Tools is a real-time software that provides effective use of your PC sound devices. It includes a signal generator, a recorder, two oscilloscopes and two spectrum analyzers. The program allows to control your recording device in time and frequency domains, record a signal to WAV file and then convert it to MP3 one. 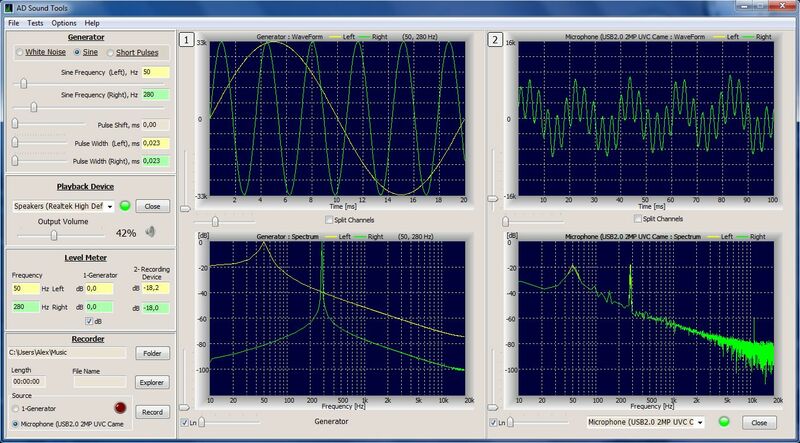 AD Sound Tools can generate sine, white noise and short pulses signals and monitor them in separate waveform and spectrum windows. Connecting the generator and an available sound device you can evaluate its frequency response using sine sweep, optionally white noise and short pulses. The data obtained can be saved as a Windows Bitmap and a text CSV-file. The program can be used in educational purposes. It allows you to perform some interesting tests with your sound devices including microphone localization and sound interference tests. Watch all DVD movies in widescreen with stereo sound on your iPhone. You needn`t to purchase them from iTunes, you can take your own DVDs. In an independent review,Dicsoft DVD to iPhone Converter was picked as the best DVD to iPhone converter.